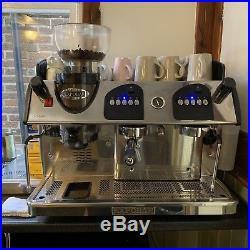 Expobar Markus 2 Group Plus Commercial Espresso Machine with Integral Grinder Condition is Used. The item "Expobar Markus 2 Group Plus Commercial Espresso Machine with Integral Grinder" is in sale since Sunday, October 28, 2018. This item is in the category "Business, Office & Industrial\Restaurant & Food Service\Bar/ Drinks Equipment\Coffee Machines". The seller is "delocha-8" and is located in Nottingham. This item can't be shipped, the buyer must pick up the item.